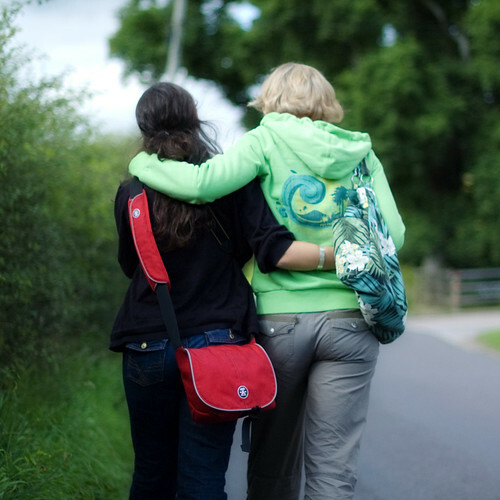 “Feeling fizzy”…that’s how us tired but happy Blog Camp 1.5 girls described ourselves this morning over breakfast; a kind of energetic bubbling up of excitement and giddyness at our blossoming friendships. We all went to bed very very late, but no one could sleep at first because of the ‘fizzy’ feeling. Our lovely hostess Beth, astonishingly eloquent for rather early in the morning, described it so elegantly as being that rare emotion that a few, select girlfriends can inspire, almost akin to ‘romantic love’ if you like. She explained it so perfectly, but ‘fizzy’ is a good summary of what it feels like. If we could bottle it and sell it we’d be millionaires! But mostly we just felt fizzy. And we liked it! And we want some more of it! And we wouldn’t mind another round of those fizzy Kir Royales (pictured above) knocked up by Beth’s super husband. Cheers! 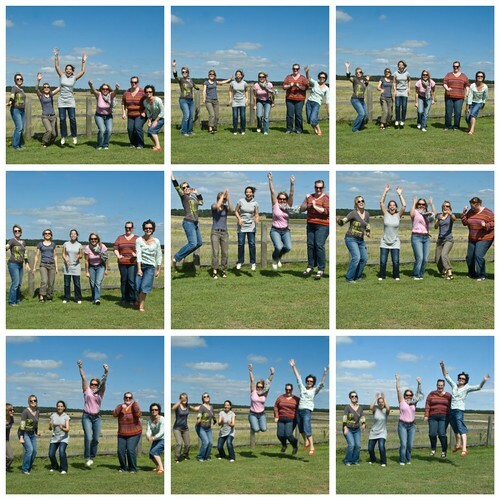 Oh, and it turns out that the ‘Group Jump’ shot hasn’t improved since Blog Camp 1.0. Shabby…very, very…shabby. Sigh, I don't understand blogger. It keeps cutting my photos at the side, even though I upload them as 'small'. Bleargh. it is cutting off the jump shot. we need a new template on this blog. the jump shots are totally hilarious. i love that. that champers glass is too beautiful! I want one! The jumping pictures crack me up. I definitely had "lift-off" issues. Well, I've always known that about myself. next stop in europe? blog camp krakow? when should we go? feel free to put it on YOUR blog! big thank you to B's PA, i mean boyfriend fiancé husband for making this for us! they're for everyone! there are three models available. all proceeds (should there be any) will go to buy blog camp beverages! see them all (the t-shirts, not the beverages) in the widget at the bottom. and order in good time because they take friggin' forever to come. blog camp is a real world get-together that was held june 19-21, 2009 in a little town in denmark for a group of bloggers who found each other in the blogosphere at a place called moments of perfect clarity. blog camp 1.0 was so much fun that a 1.5 was held august 15-16 in the UK followed closely by blog camp 2.0 in denmark sept. 4-7. blog camp 3.0 took place in denmark in january 2010.
laughter was laughed. coffee, wine and good food were consumed. pictures were taken. and we jumped. and we tweeted and blogged. now taking suggestions for dates & locations for next year's blog camps! email us. any of us. all are welcome to follow, even if you're not actually attending blog camp this round!! blog camp 2.1 - Reno! 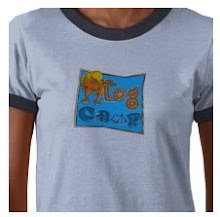 blog camp t-shirts now available! how on earth did i forget to put this here? this idea is ours and if you use it without asking, we will send some armenian guys we know your way.